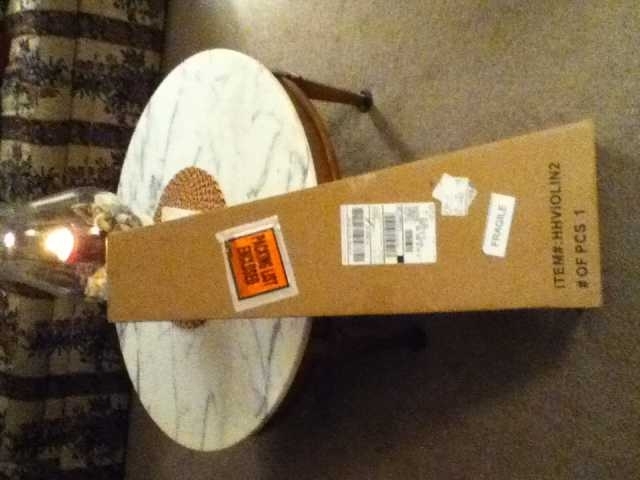 Hey my first violin arrived ! I watched Fiddlerman's vid on the $109 violin to see about setting the bridge. 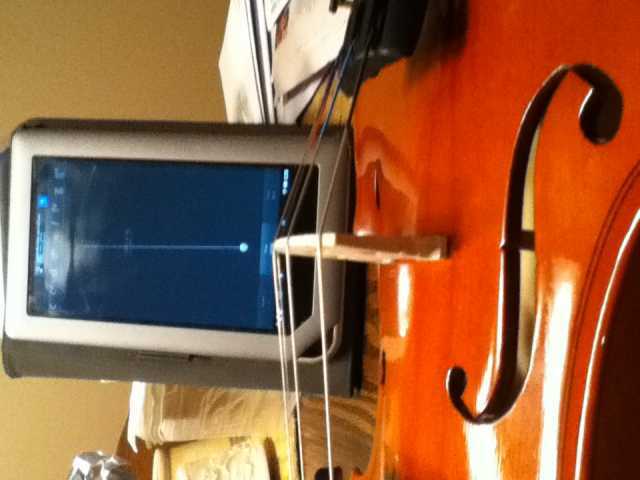 Then downloaded a violin tuner on my Nook (hacked) from Google Play. Hope that things are set correctly as I plan to test it out this weekend. Already saving for a better instrument! Thanks in advance for any "getting started" advice . Welcome to Fiddlerman Forum, Ray. Tell us more about your new violin. What make is it? Don't rush into buying another violin just learn to play this one as well as you can and then try different strings on it, play with the bridge the sound post and experiment with it. Then when your ear gets good enough, and it will, then buy a better one. Congratulations. Hope it's a nice one. Well it appears to be a MAXAM. Chinese made. Doesn't appear to be an instrument that will be seen at Carnegie Hall anytime soon. It was already on its way when I came across this site. or experimental platform for electronic recording into Audacity or Musescore. ...Don't rush into buying another violin just learn to play this one as well as you can and then try different strings on it, play with the bridge the sound post and experiment with it. Then when your ear gets good enough, and it will, then buy a better one. Congrats on the new fiddle. I can tell by the pics you will need to trim your bridge for best sound. Lots of info online for that. I started with a $50 violin and learned to carve bridges and make adjustments on it. valuable knowledge to gain. Congrats on your new violin, plumguy! Looks nice. I would agree with others who have said not to think too poorly of it right away or be immediately looking for an upgrade to another violin. It looks like it will work fine for learning your basics and by then you will know what sot of sound and etc you are looking for when you do decide to upgrade. 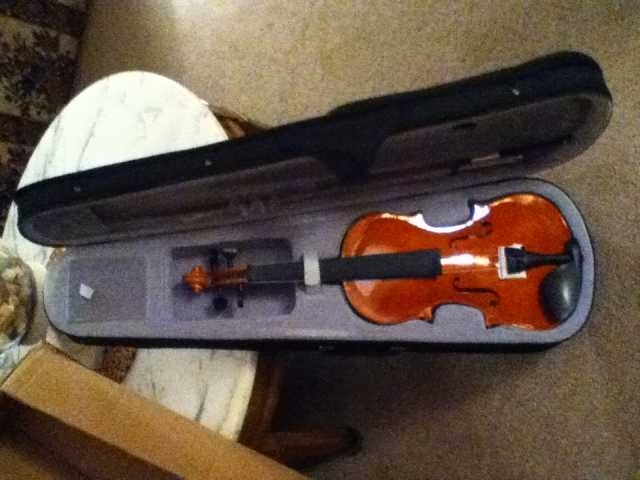 I like to think that what I learned about violins was worth more than the 60$ my first acoustic one cost. While I might plan to upgrade, it won't be anytime soon. Let''s just say that my wife is the "rate-limiting step"
on the growth of my PayPal account. I won't say that there probably aren't some real lemons.. But more than a few folks on this forum play inexpensive violins that sound pretty darn good after some TLC and some playing. Usually the setup is the worst thing. First thing I would do would be measure the height of the G string and the E string right at the end of the fingerboard nearest the bridge. Then measure the distance from the nut to the bridge, (in other words the part of the string that does the most work in vibrating). Folks here can tell you if those are reasonably correct. If they are, then it theoretically should play at least "ok".